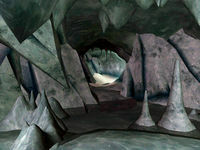 Rimhull is a small ice cave located west of Skaal Village. The Necromancer Tymvaul is practicing his evil arts in this cave as part of the Tymvaul in the Well quest. There are two ways to enter this cave: one is from the well behind Lassnr's house, and the other is from the entrance south of the well. Besides a few skeletons, the only thing of interest is Tymvaul's robe: the Mantle of Woe. "Rimhull" means "frost hole" in Norwegian. This page was last modified on 17 March 2017, at 02:28.